The Amethyst Serpentine Cremation Ring is expertly crafted from sterling silver into a tasteful design. 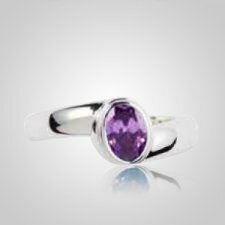 The amethyst colored glass in this ring represents the month of February. This cremation ring will hold a nominal portion of cremains. Create a memorable tribute or unforgettable gift with this stunning cremation ring.